When you draw a card on your turn, reduce its cost by 1. 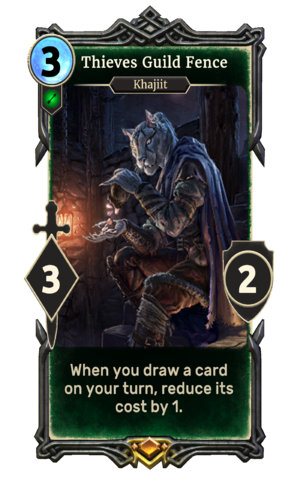 Thieves Guild Fence is a legendary Agility creature card. It is part of the Heroes of Skyrim expansion. "What are we going after?" "Think it's worth dying for?" This card's ability applies the Discount Pricing card effect.